Graphic Design for Poster and Flyer. 2012. 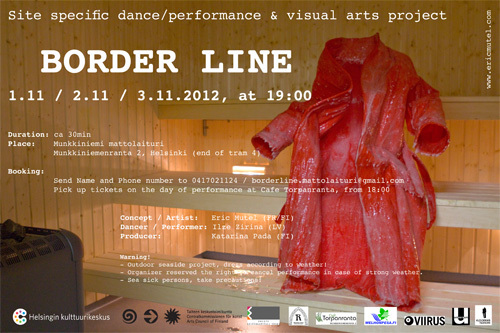 For the group project Border Line, dance /performance and visual arts, in Helsinki, 2012. Graphic design realized together with Katarina Pada. Graphic Design for Poster and Flyer. 2011. 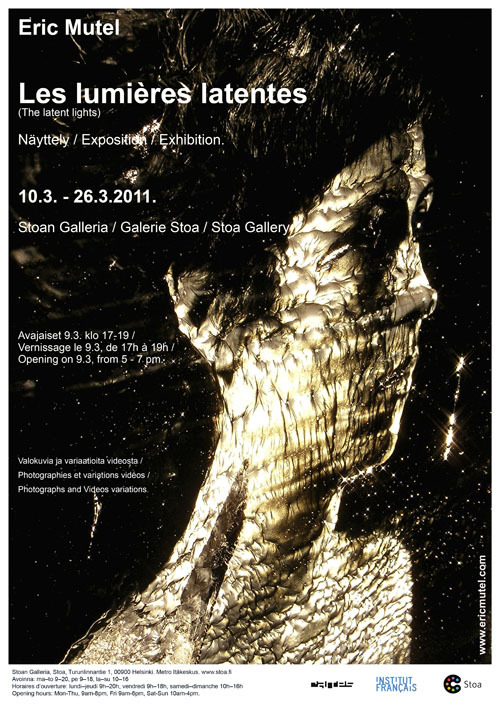 For an individual exhibition of mine, with photography and video. Gallery Käytävä and Gallery Stoa, Helsinki, Finland. 2 sides flyer, to be flipped vertically. Graphic Design for flipbook cover. 2007. 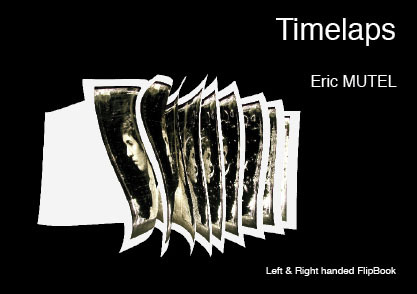 Edition#0 of Flipbook "Timelaps", Freak Book 1#0, by Eric Mutel. 2007. Graphic Design for Poster and Flyer. 2005. Personal Arts project production, with working team. 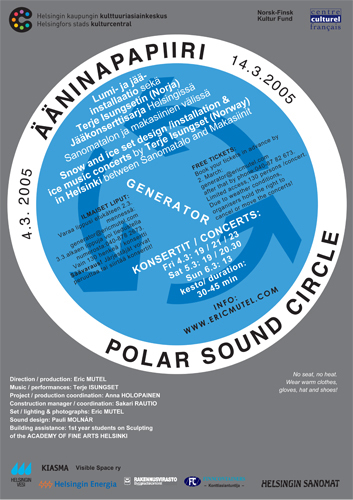 Installation, Stage design, Lighting Design, with ice, snow, frozen liquid emulsion photographs prints in ice, for ice music concert by Terje Isungset. Park of the Arts, Helsinki, Finland. 2002. 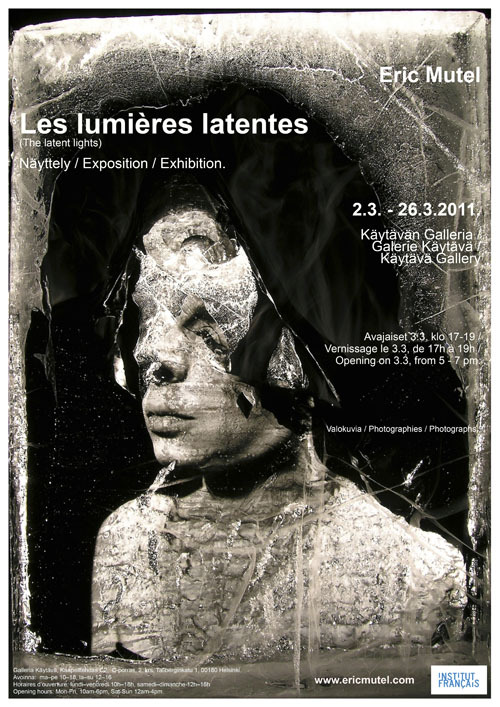 Installation with frozen liquid emulsion photographs prints in ice, ice, lighting, inside a freezing Container. Graphic Design for Poster and flyer. 2002. Andorra movies theatre, Helsinki, Finland. shifted view of artist. QT - 00'06'' - 192Kb. Here are mainly some links to places, festivals or institutions where i have been and where i have shown my works and also links to people i have been collaborating with or been in touch with. Ilona Jäntti, Circus Artist, Acrobat, Dancer. Finland/UK. Franziska Agrawal, Visual Artist, photographer, sculptor, Industrial designer. Germany. Antonia Ringbom, animator, illustrator, producer. Finland. Terje Isungset - Musician / Percussionist / jazz / ice music.... Norway. Manuela Morgaine - Theatre director / writer / artist / Filmmaker... France. Claudia Kappl - Artist / lighting designer / architecture lighting.... Austria/USA. Kimmo Pohjonen - Musician / accordeon / sound artist and More.... Finland. Franco Ross Adams, Sound recording artist. UK. Camille Mutel. - Choreographer, Performer, Dancer, director of Li Luo Dance Cie, France. 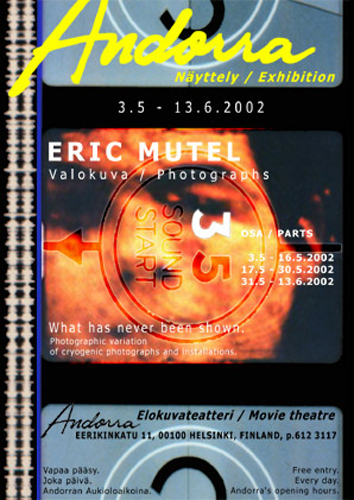 Aave Festival, alternative audio visual events, Helsinki, Finland. Hovden Snow and Ice sculpture Festival, Hovden, Norway. Cartes Flux Festival, CARTES, Espoo, Finland. CARTES, centre of Art and Technology Espoo, Weegee House, Espoo, Finland. Hanko Theatre Festival, Hangö teaterträff, Hanko, Finland. NOASS culture center, Riga, Latvia. Festival Time to Dance, Laiks Dejot, Riga, Latvia. Brygger J.C. Jacobsens Portrætpris, Denmark. LOIKKA, Dance Film and video Festival, Helsinki, Finland. Cinemaissi, Latin American film festival, Helsinki, Finland. HIFF, Helsinki International Film Festival, Helsinki, Finland. Espoo Cine International Film Festival, Espoo, Finland. Centre Culurel Français, Riga, Latvia. Pikene på broen, Kirkenes, Norway. Institut Français , Helsinki, Finland. XL Art Space, Helsinki, Finland. Jojo, Oulu dance center, Oulu, Finland. Hippolyte photo gallery, Helsinki, Finland. Olga Zitluhina Dance Cie, Riga, Latvia. Dance in Latvia, Riga, Latvia. Dance Cie Li Luo, Nancy, France. 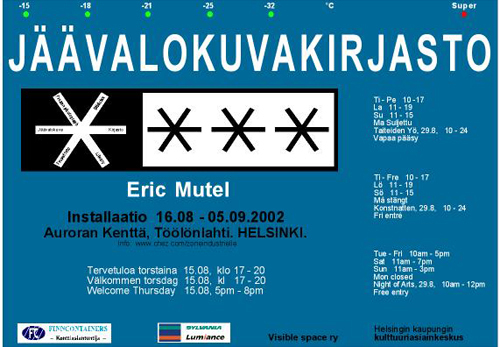 Arts Council of Finland, Helsinki, Finland. Helsinki City Culture Center, Helsinki, Finland.